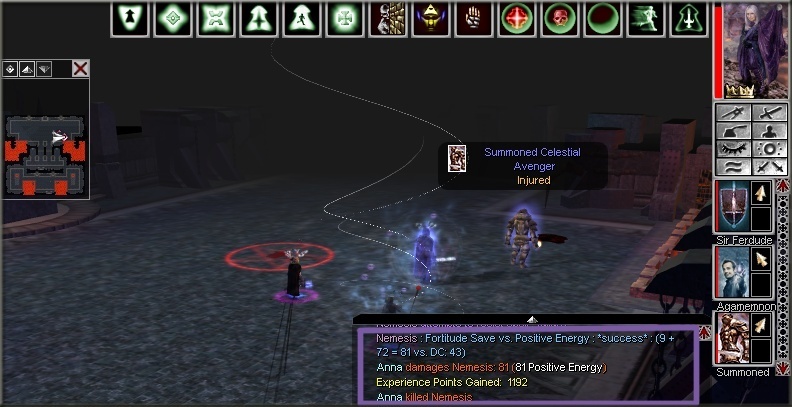 Anna and Agamemnon fought their way through hordes of demons and nasty traps, most of which was removed by their very own meat shield, who rocked the dwarven-style trap-remover way; Ferdude! Eventually they met up with the Nemesis...a big final battle began, lots of spells was thrown around in the heat of battle, as well as a few sword swings by the warrior of the party, and Anna, faster than the two others, got the lucky last throw, with one of her favourite spells, reserving herself the bragging rights of having killed the Nemesis! This was actually her first time having gone that far into the Dark Realm too ...she has explored the other parts, but it's the first time she paid a visit to that particular corner of the dark realm! So I went with blasting him with white raptures and redeeming flames; the Nemesis was seriously fried up afterward! Anna had prepared for the moment when she would be facing the Demonlord Horaxona on her own for a while...but when the time had finally come to pass, it was a rather anticlimatic feeling she was left with after her first offensive spell turned the Demonlord even other demons feared to dust before her eyes. "Was that it? The reavers posed more danger to me than their Demonlord..." She couldn't help but think, smirking. Her spell prowess is just that much greater than the most feared demonlord...next up: Veleron! It took me 3 castings of dissonance at the earliest. And that someone would likely be me, I've made it my point to kill one demon lord daily in the last week or so. It just so happens there's only one. So she doesn't respawn at all, or does it take a very long time? "Hands off, Veleron is mine." 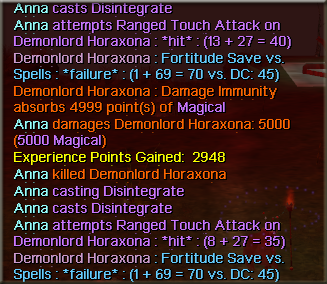 She seems to be 1 per reset, or her respawn rate is *very* long.